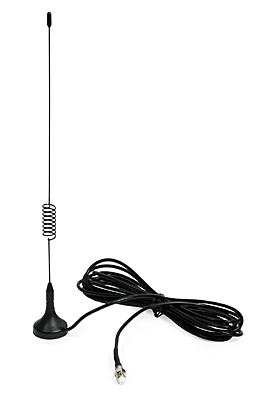 TRANS-DATA DW5 A741005 GSM/DCS/UMTS indoor omni-directional antenna has been designed to improve the GPRS/UMTS connectivity to payment terminals. The antenna has 5 dBi gain in the GSM/DCS/UMTS bands. Due to magnetic base, it can be firmly placed on any steel surface. In many businesses, a major difficulty is the lack of adequate cellular coverage required for a reliable operation of payment terminals. It is the reason of problems with verifying some transactions - long waiting time or even connection failure. The solution to the problem is application of the antenna, which can be connected directly to the terminal unit with FME connector. TRANS-DATA is a brand of high quality antennas for wireless reception and transmission of digital data. Thanks to high quality materials and very good performance, the antennas are characterized reliable and stable parameters. TRANS-DATA antennas significantly improve signal strength and increase the coverage area.